Only 2 minutes from 95! Check out some of Buffalo Mo's tasty menu items! We serve breakfast, lunch, dinner, and drinks! Buffalo Mo's has more than wings! Be sure to check out our Events page to see what's happening at Buffalo Mo's. If we don't have it, ask us and we'll add it! Come down and enjoy a game of pool or darts or catch the game on over 20 TVs! In addition to HD televisions, darts, fantastic food, drinks, and friendly service, Buffalo Mo's offers a convenient place in Stafford, VA for you to play pool! Come down for a quick game and bring some friends! Looking for delicious chicken wings and a variety of flavors to choose from? Buffalo Mo's in Stafford, VA offers flavor selections that will make your mouth water! A Buffalo wing or chicken wing in the cuisine of the United States is a chicken wing section (flapper or drumette) that is generally deep-fried, unbreaded, and coated in vinegar-based cayenne pepperhot sauce and butter. They are traditionally served hot, along with celery sticks and/or carrot sticks with blue cheese for dipping. 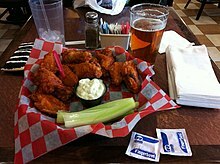 The Buffalo wing was invented in 1964 at Anchor Bar in Buffalo, New York. There are several different claims about how Buffalo wings were invented. Upon the unannounced, late-night arrival of their son, Dominic, with several of his friends from college, Teressa needed a fast and easy snack to present to her guests. It was then that she came up with the idea of deep frying chicken wings (normally thrown away or reserved for stock) and tossing them in cayenne hot sauce. Dominic Bellissimo (Frank and Teressa's son) told The New Yorker reporter Calvin Trillin in 1980: "It was Friday night in the bar and since people were buying a lot of drinks he wanted to do something nice for them at midnight when the mostly Catholic patrons would be able to eat meat again." He stated that it was his mother, Teressa, who came up with the idea of chicken wings. There was mis-delivery of wings instead of backs and necks for making the bar's spaghetti sauce. Faced with this unexpected resource, Frank Bellissimo says that he asked Teressa to do something with them. However, a long article about the Anchor Bar in a local newspaper in 1969 does not mention Buffalo wings. Another claim is that a man named John Young served chicken wings in a special "mambo sauce" at his Buffalo restaurant in the mid-1960s. His wings were breaded. Young had registered the name of his restaurant, John Young's Wings 'n Things, at the county courthouse before leaving Buffalo in 1970. Marketing materials for Frank's RedHot claim that it was the hot sauce used in the Bellissimos' original recipe. © 2017 Buffalo Mo''s. All rights reserved.